Seasons of Opportunities: Do You Live... Like Heaven Changes Everything? 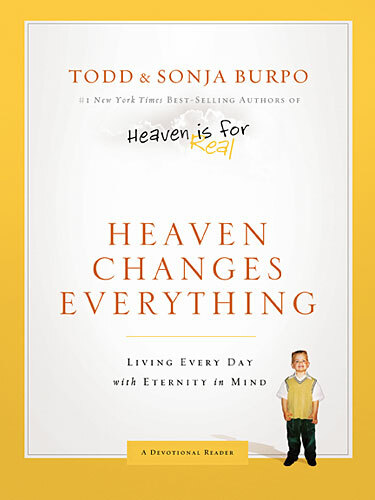 Do You Live... Like Heaven Changes Everything? 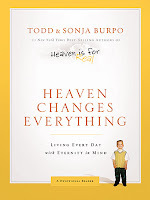 Todd and Sonja Burpo authors of the book Heaven is for Real, have released this new book Heaven Changes Everything. What if we lived every day in light of eternity? Would we live differently? What priorities would change? In their newest book the Burpo's are encouraging their readers to "live every day with eternity in mind". Each chapter is a short reading recalling excerpts from their first book and how those thoughts affected them and the way they lived. It is a devotional type reader, with short chapters that could be read as a thought a day. This book is a great reminder that we are here for a greater purpose than just our everyday life and its challenges. So many times we allow material things to take precedence over spiritual, until we end up living discouraged depressed lives instead of the abundant life God has for us. His plan is so much greater, that we need to put on our spiritual goggles and live in light of eternity! This book would make a great gift for anyone. And is definitely worth the read! Todd and Sonja Burpo's almost-four-year-old son, Colton, made a trip to heaven and back during the darkest, most-stressed-out days of their lives. Times were tough, money was scarce; and the bills, frustrations, and fears were piled high. (Read about it in their first book Heaven is for REAL) They have drawn on those experiences and Colton's experience to write this devotional. What about you? How are you living your life today with eternity in mind? You can purchase this book on Amazon, other online retailers, or your local bookstore. Amy, you are so right. I know so many people who fill their lives with 'thing' as opposed to love and joy. This sounds like a great book, maybe even a good Christmas gift! I do live like heaven changes everything - it's a game changer for me. Even if it didn't exist I would want to have lived every day as if it did. I've read this book, and it is wonderful.